As we look back at the year, the theme for the Bozeman Real Estate market in 2017 was inventory shortage. 1000 single family homes sold in the areas both inside and outside of Bozeman’s city limits at a median sold price of $409,450 in 2017. 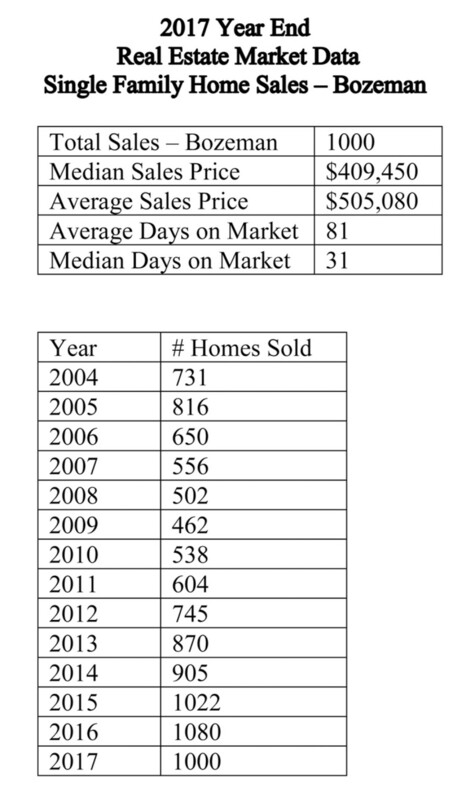 This is compared to 1080 homes sold last year at a median sold price of $374,900, a 9.2% increase in median sold price. Restricting the data to homes sold just inside Bozeman city limits, 565 homes sold in 2017 at a median sold price of $381,500, compared to 588 homes sold last year at a median sold price of $359,250, a 6.2% increase in median sold price. While the overall number of homes sold inside and out of city limits was down slightly, so was the amount of available inventory. Builders were really feeling the squeeze as the number of lots listed in 2017 was down significantly. 176 lots were listed for sale on our local Big Sky Country MLS in 2016, but only 67 lots were listed in 2017. This number isn’t perfect as many lots are sold directly from developers to builders, but it helps to illustrate the shortage of buildable dirt in Bozeman. Looking at available listings, 1298 single family homes were listed for sale in 2016, while only 1180 homes were listed for sale in 2017. The 1180 homes sold in 2016 equates to a roughly 83% listed to sold ration. The same number was 85% for 2017. The month’s supply of homes continues to edge lower with 2.8 month’s supply in 2017 compared to 3.2 months in 2016. This is the number of months it would take to sell the current homes on the market. Some often consider a “healthy” or “normal” market to have somewhere between 4 and 5 month’s supply. A higher number represents a buyer’s market while a lower number represents a seller’s market. The condo and townhouse market also saw an increase in median sold price while the number of sales was essentially flat. 511 condos and townhomes sold in the areas in and around Bozeman in 2016 at a median sold price of $235,000. In 2017, 509 units sold at a median sold price of $260,000, a 10.6% increase in median sold price. It appears our idyllic valley will continue to grow. The Bozeman School District is looking for land to build 2 more elementary schools and the Bozeman Yellowstone International Airport just recorded its eighth consecutive year of record growth. At this point, Bozeman really needs more buildable lots in order to keep up with growth and ease the inventory shortages.